Weighing vs. Measuring – Does It Really Make a Difference? One of the more important lessons I learned in culinary school had to do with weighing ingredients for baked goods using a kitchen scale, rather than measuring them with measuring cups and spoons. Some thought it was overly fussy! What happened to allowing for chef creativity, throwing in a little of this and that? Our grandmothers and great-grandmothers measured with cups, spoons and hands, using their sense of sight, touch and smell when baking and cooking. Repeating these tasks daily or weekly with much trial and error, they developed highly-innate senses and their own standardized recipes. Today, most of us do not bake and cook in that same way and instead rely heavily on weights and measures as written in published recipes. The challenge anyone faces with measuring ingredients for baked goods using measuring cups and spoons is that 1 cup or 1 teaspoon is not going to be the same each time. If seven people each presented 1 cup of flour, there would be seven different amounts. Some would scoop the flour, some would spoon it into the measuring cup. Some cups would be leveled off evenly on top, some slightly overflowing, with others slightly dipping in the middle. The result? When used in the same recipe, each final product would turn out slightly different. When cooking a soup or stew, ingredients can oftentimes be increased or decreased slightly or substituted without affecting the structure of the final dish – and you may even like it better.With baking, the amount of each ingredient in a recipe contributes greatly not only to the flavor, but to the texture, structure, density and moisture content of the finished product. Too much flour in a baking recipe can result in a dry, tough product. Too little flour can make a baked good wet and gooey. Another point to keep in mind with regard to measuring and weighing ingredients is that 1 cup (measured in a measuring cup) does not always equal 8 ounces (when weighed on a kitchen scale). Many cooks use those two figures interchangeably but results can be altered greatly by doing so. To illustrate this, let’s look at 1 cup of a few common ingredients as listed in the King Arthur Flour Master Weight Chart and note the difference in weights. Differences can be found in recipes regarding the weight of flour depending on the type of flour used. 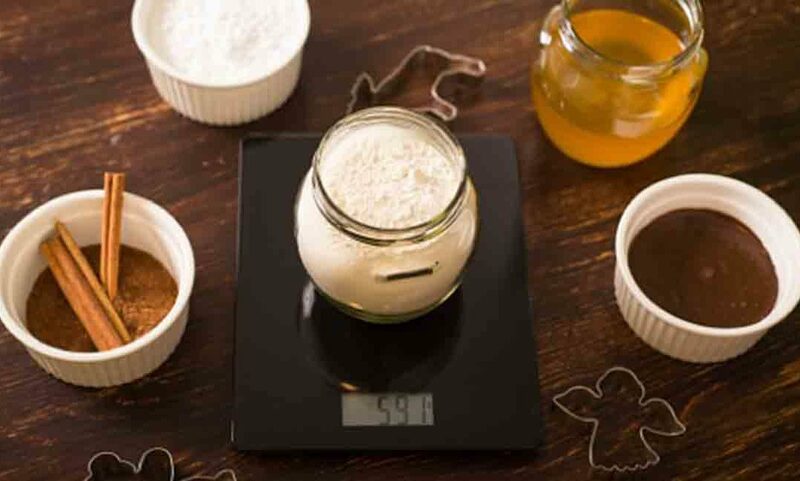 Experts from Cooks Illustrated (Measuring Flour) and Rose Levy Beranbaum (Flour by Rose Levy Bernabaum) use an average weight of 5 ounces per 1 cup based on use of an all-purpose flour in their recipes. That amount changes with flour type – cake flour, whole wheat, flour almond flour, etc. – due to variations in flour density. If weights are provided in a recipe, follow what is listed. If no weights are provided, 5 ounces is a good choice for all-purpose flour, but note the results. Many baking recipes have certain ingredients listed by both weight and measure – usually flour, sugar, fruit, and liquids – because these affect the recipe outcome the most. For ingredients that are too small to weigh with general kitchen scales, like baking soda or powder, salt and pepper, weights may not be provided, only measuring spoon amounts. Fully standardized recipes used in commercial kitchens and manufacturing list all ingredients by weight. READY TO CHOOSE A KITCHEN SCALE? OXO, Escali, and Taylor are brands that come highly recommended by professionals and reviewers alike. There are many styles, sizes and price points available. From personal experience, I highly recommend the OXO Stainless Steel Scale with Pull-Out Display. It has been extremely reliable in my busy kitchen for both personal and professional use and I find the pull-out display feature very handy. The 11-pound capacity works well for my purposes, but you may wish to consider the 5-pound or 22-pound options depending on your use. For weighing those very small amounts, I use AWS-100 Digital Scale. It is compact so storage is not an issue and it has a 100-gram capacity. In the past, I have also used Taylor brand kitchen scales with very good results.